What is carob? 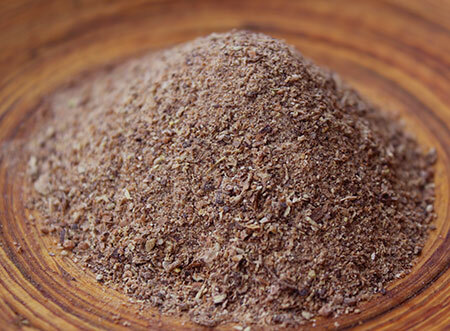 Many people are familiar with the powdered version of carob, which is commonly sold roasted and used in desserts and beverages as a chocolate substitute, but do you know that carob is actually made from the husk of an elongated bean-shaped pod? 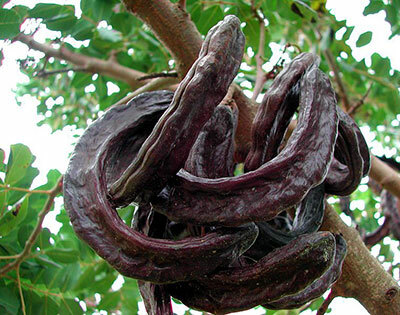 Carob (Ceratonia siliqua) is the fruit of the carob tree and grows as long, slightly curved, thick, dark brown pods anywhere from 4-10 inches (10-25 cm) in length. Although it does tend to turn recipes a dark chocolatey color, it does not quite have the same flavor as chocolate in our opinion. Raw carob is subtly sweet and not at all bitter with a pleasant almost caramel-like taste. And, unlike the cacao bean, it doesn't require as much sweetener when used in traditionally prepared carob desserts like fudge, puddings, drinks, pies or cookies. 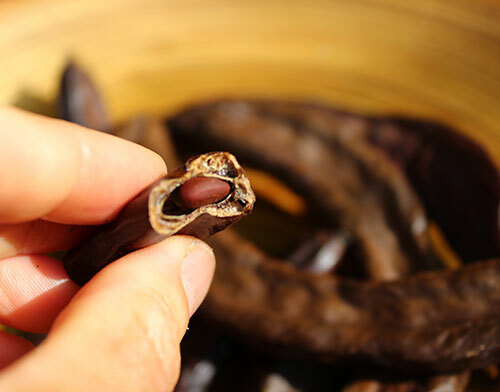 You can actually eat fresh ripe carob pods straight from the tree, just make sure to look out for the tiny hard seeds which are not edible in their unprocessed state. 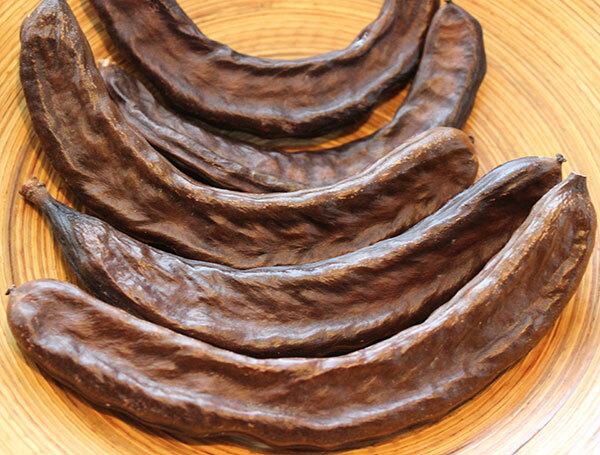 Fresh pods are the best and most nutritious form of carob. 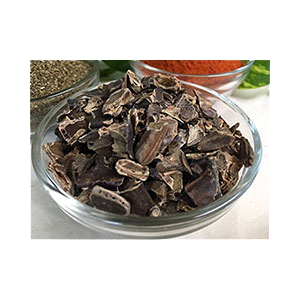 The de-seeded dried carob pods can also be used to make fresh raw carob powder, which is sometimes hard to find in stores. Carob trees are very hardy, robust evergreens that can be found growing in many parts of the world, sometimes in the wild, but are also common trees in cities and rural landscapes. There are many cultivars of the carob tree all with slightly varied characteristics. 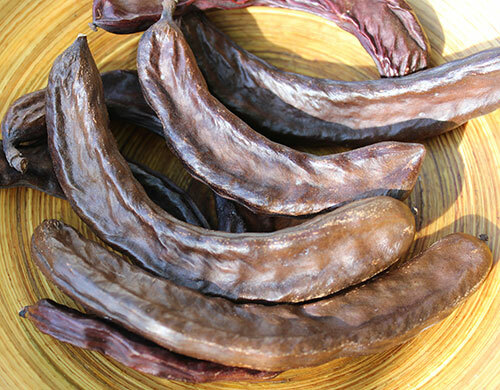 Just like there are different kinds of apples, there are different kinds of carob. In Cyprus, an island in the Mediterranean Sea, they have "honey carob" which produces a soft textured pod and is known to ooze a dark syrup. In California they have the Santa Fe variety which is typically a drier pod, but can still be eaten fresh or further processed to make carob powder. From a nutritional standpoint, carob is rich in a number of vitamins and minerals, but is known to be particularly high in calcium. 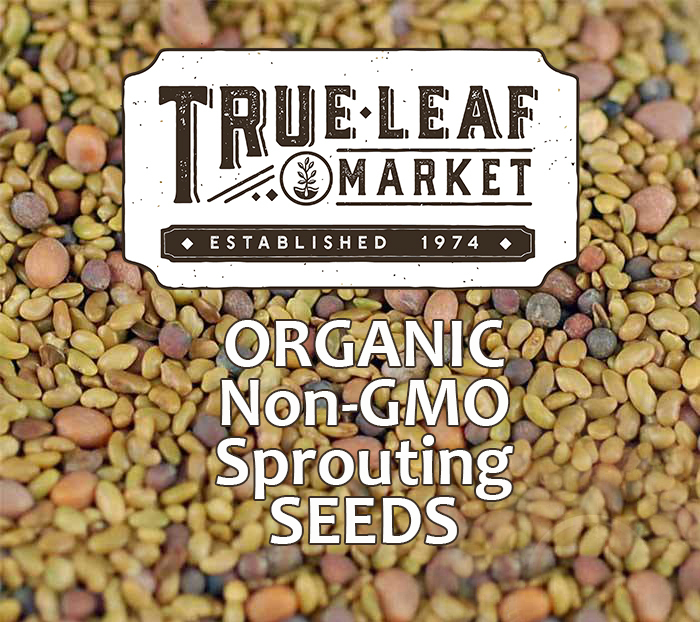 Being a member of the legume family, it is a source of protein and contains a substantial amount of dietary fiber. 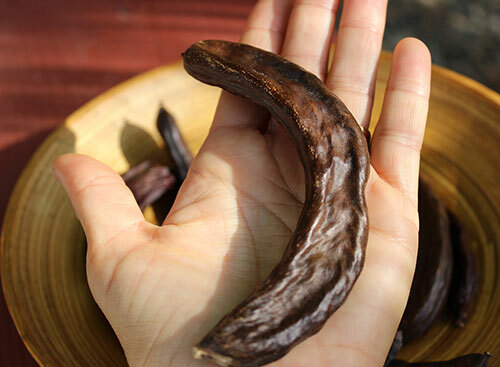 Throughout history carob has been used as a digestive aid and was traditionally used to soothe an upset stomach. Carob contains some antioxidants, mostly in the form of polyphenols. 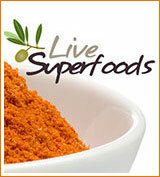 It has alkalizing effects on body pH and in certain cultures it is considered to be an aphrodisiac. For thousands of years, carob pods and powder have been used extensively by civilizations located in the Mediterranean region as well as those along the Adriatic Sea. The carob tree has been around for a very long time with one of the first early records of its use dating back to ancient Egyptian times. 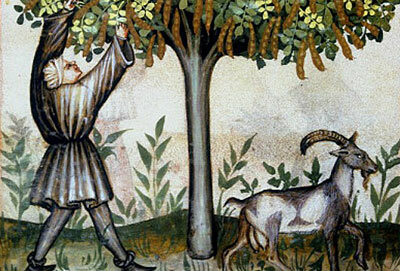 In fact, the image of the carob pod was actually used in Egyptian hieroglyphs for the word "sweet." It is also known that the gum-like qualities of the carob seed were used as a binding adhesive for mummies buried in tombs. Interestingly, the seeds were used as one of the very first units of measurement referred to as "carats." 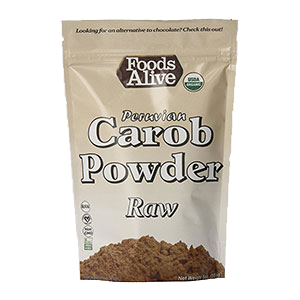 Carob is also called "St. John's bread" which goes along with the famed story of St. John, the Baptist monk, who enjoying eating the pods of carob fruit. The word "bread" most likely relates to the soft texture of the fresh ripe pod that is slightly chewy in nature. This is further referenced in the Book of Matthew when it was mentioned that John the Baptist subsisted on "locusts and wild honey." Carob is also called "locust bean." 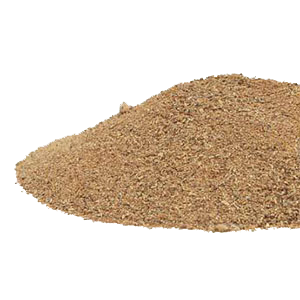 Throughout history it has been used as a reliable food source during times of famine as the trees are drought resistant and can persevere under harsh conditions in poor soils. Carob has been utilized as a syrup, liqueur and ingredient in compote throughout the Mediterranean region. The island of Cyprus is well known for their carob syrup commonly called "black gold." The syrup is also used on Crete, one of the Greek islands. Medicinally carob syrup is also used in Malta for coughs and a sore throat. The pods were considered a nutritious livestock feed, either as a meal or used as whole pods. Many countries around the world currently use it today for camels, llamas, other domesticated animals and it is often used commercially in dog treats. 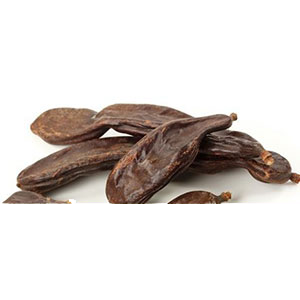 Carob is still used today as a beverage and eaten fresh for ceremonial purposes in Islamic customs and has long been a traditional food in the Jewish community for special holiday celebrations. 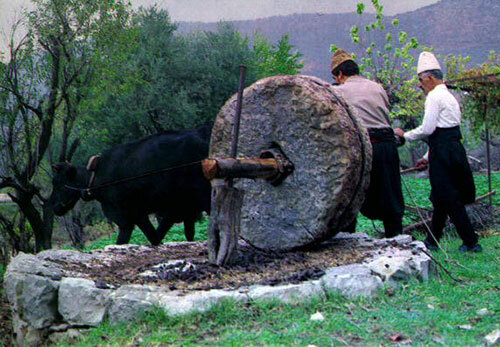 The old-style carob press can still be found in small villages in Lebanon and other parts of the world. Today the top carob producing countries are: Spain, Italy, Morocco, Portugal, and Greece. 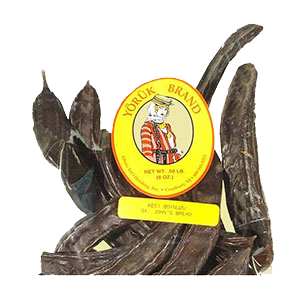 But carob has made its way all around the world, including California, and most any area where dry warmer conditions persist. Mohammed's army ate "kharoub", and Arabs planted the crop in northern Africa and Spain, along with citrus fruit and olives. The Spanish transported carob to South America, Mexico and California, while the British were primarily responsible for carob's migration to India, Australia and South Africa. Carob pod seeds are the source of "locust bean gum", an emulsifier and gelling agent widely used in the commercial food industry in a variety of products such as ice-cream, salad dressings, sauces and dairy products as well as in many non-food related items like cosmetics, industrial oils and pharmaceuticals. The seed itself is made up of a polysaccharide, mucilaginous tasteless gum and is industrially removed from the pods through a process called kibbling to separate the seed from the pulp. The seed is acid treated to remove the skin and further milled into a powder to produce "locust or carob" bean gum. Carob is from the carob tree (Ceratonia siliqua) and is part of the legume family and native to the Mediterranean regions. The trees tend to grow well anywhere that citrus or olives can grow but prefer drier Mediterranean-like climates. It is commonly cultivated in many parts of the world as an ornamental shade tree that can grow quite large in size and, as an evergreen, the leaves remain on the tree for the entire year. It has a particularly long tap root which is said to account for its ability to survive for up to 200 years, producing carob fruit for most of its lifespan. Some older trees are said to produce an average of 200 to 250 pounds a year! Carob trees are a nitrogen fixing species, which helps to improve soil fertility in areas that are dry and barren. They are a great tree to use in permaculture design for this reason, offering a shade canopy for other plant species and will help build back depleted soils. They are also very resistant to pests, fungus or diseases and the small flowers are known to produce large quantities of nectar attracting local bee populations. The developing pods are a green color and turn dark brown when ripe in the late fall season. To identify a carob tree you may or may not see pods depending on the time of year. The young pods are a green color and turn brown when ripe. It is important to remember that there are many types of trees that grow long bean-like pods that are not edible. One of the best ways to identify carob, besides the pods, is to take a close look at the leaves themselves. They are green, rounded, somewhat shiny and can have either curved or flat edges. 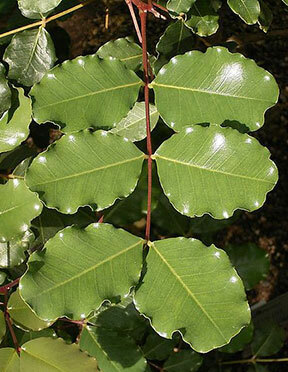 These leaves also stem off of a reddish colored branch. 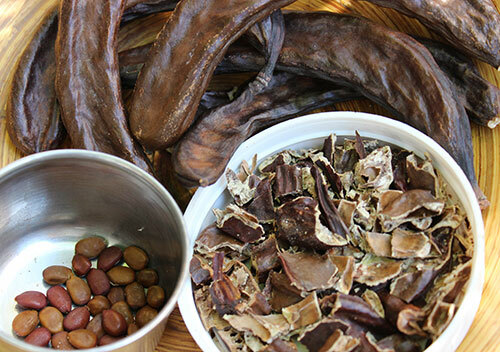 When harvesting carob pods choose the thick dark brown pods as they tend to be softer with more pulp fiber. Store them in a paper bag (instead of plastic or a sealed jar) because they need to be properly ventilated or they may rot. The cuttings from a fruit-bearing carob tree may produce pods within 3-4 years. When grown by seed this process may take between 6-8 years. It is a good idea to purchase your seeds so you know what carob variety you are growing and can choose among your favorites. The seeds should be soaked for 24hrs and planted in sandy, clay loam or rocky soils with good drainage. Generally, the pH should be between 6.2 - 8.6. Carob trees enjoy full/semi sun to partial shade. 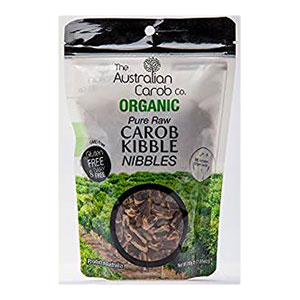 As we mentioned, the health benefits of carob are significantly greater when eaten in their raw natural state as opposed to heated or chemically processed. Therefore, the nutrients available in carob may vary depending on the source and sometimes variety. In general, carob contains a wealth of various minerals like zinc, copper, magnesium and selenium. 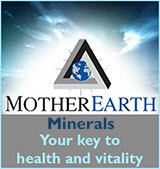 However, it is especially rich in potassium, iron as well as calcium. The higher amounts of calcium and other alkaline minerals provide for carob's benefits as an alkalizing food that can help to counter acid levels of other foods. The nutritional value of carob also includes protein, amino acids, omega fatty acids and many of the B vitamins along with vitamins A, E, C, and K.
A 2009 study, published in Plant Foods for Human Nutrition, comparing the nutrients in freshly prepared carob powder vs. commercially prepared carob, it was revealed that there is a higher protein content (40% more) in addition to higher amounts of the amino acid lysine in fresh home-prepared carob. The study also affirmed a more balanced 6:1 ratio of omega-6 fatty acids to omega-3, which is better than many nut or seed varieties, aside from chia, flax, hemp or walnuts. 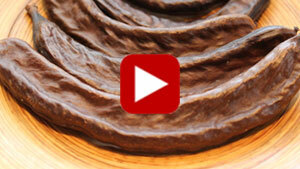 What is carob fruit's source of sweetness? The pulp of the carob pod has a total sugar content of between 48-56%. Again, this is largely dependent on the variety of carob as some are higher in sugar than others. The antioxidant content in the fiber of the carob fruit is composed of a number of polyphenols, mainly flavonol-glycosides and tannins, such as gallotannins, gallic acid as well as the glycosides myricetin and quercetin in addition to small amounts of methyl gallate and cinnamic acid. According to a study in the Journal of Agricultural and Food Chemistry, carob pods are known to exhibit antioxidant activity because of their high amount of these polyphenols. Some of these components are therefore helpful for protecting the immune system and also serve to help eliminate environmental toxins from the body. 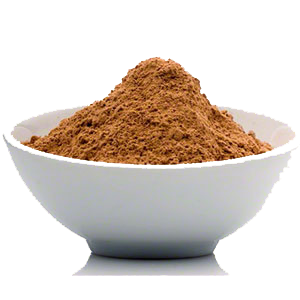 Ripe raw carob powder is a great source of dietary fiber, containing pectin (a natural detoxifier), plus the polysaccharides cellulose and hemicellulose. These fibrous nutrients can be particularly helpful for sweeping the digestive tract and can act as a mild laxative. Moreover, the sugars in carob give it a gummy quality that acts as a thickener, absorbing water, which is also thought to be helpful in preventing loose stools. It is a traditional remedy used to help with nausea, vomiting and an upset stomach. The addition of carob to your diet, in various desserts and snack foods, might be another food option to help balance cholesterol and keep your heart healthy. Carob is often used as an alternative to chocolate for those who are sensitive to the caffeine or theobromine present in cacao beans. Although carob really doesn't taste all that much like chocolate, equal parts of the powder can be used to replace cacao powder in recipes. Carob, like chocolate, goes well with vanilla, mint and orange flavorings but doesn't need as much sweetener when used in desserts because it is not bitter like chocolate. 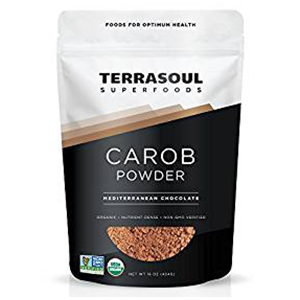 Carob also does not have a high fat content like pure cacao and because its high in calcium blends well with cacao (which is high in magnesium) in raw dessert recipes. You can simply eat the ripe pods whole by chewing on them and discarding the seeds. If you have never had fresh carob it is quite a treat and hard to stop eating. 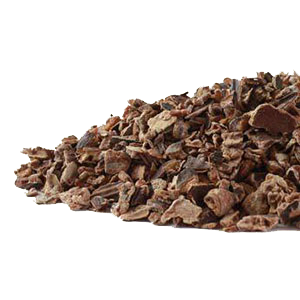 To make a carob powder, it is best to use carob pods when they are ripe, fresh and somewhat soft. Carob pods that are dry tend to sound like rattles when you shake them. Cut the ends and sides off the pods, break up the pod with your hands or use a knife to cut or peel back the top layer to de-seed them. 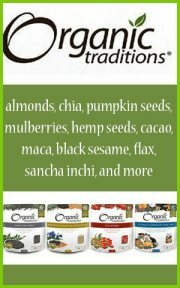 The carob seeds are very hard and not edible, but can be used to plant a carob tree in your backyard or garden space. Break up your carob into pieces and let them dry out a bit in a dehydrator before you grind them into a powder. You can do this in a coffee grinder, high speed blender or a NutriBullet also works. 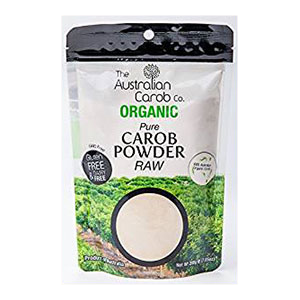 Raw ripe carob pod and powder is a great nourishing fiber-rich food to add to many dessert recipes, shakes and hot beverages. Most people who have used carob have likely bought it roasted. It is traditionally prepared this way to increase flavor. 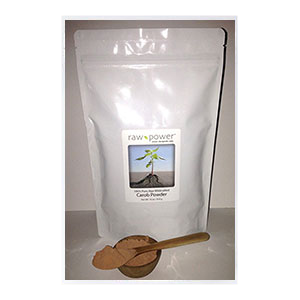 However, there are raw carob powders available that are considered more beneficial to health. 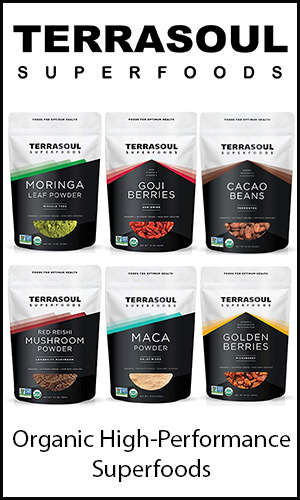 These raw powders contain active nutrients that have not been destroyed through excessive roasting or high heat temperatures. If you are following a raw food diet, you might want to make sure you are getting the really raw version as most advertised as "raw carob" have actually been heat processed over 118°F. 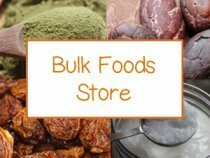 Really raw carob powder can be purchased from certain online distributors if you don't happen to have access to local fresh carob pods. The other option is to buy the dried carob fruit or pieces in bulk and powder the pods down yourself. Many times all the carob you might be able to find in stores is heated or roasted. 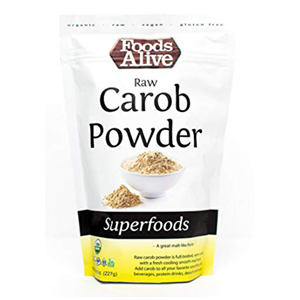 There are still some health benefits present in these types of carob powders and, moreover, some of you may just be using it for its flavor not necessarily for health reasons. 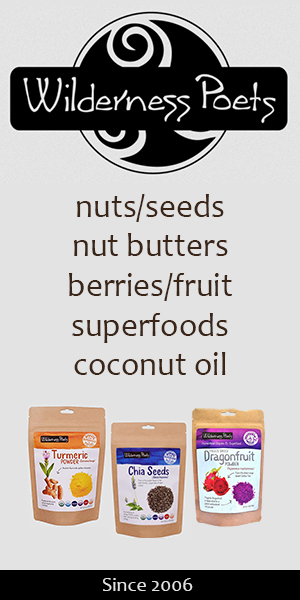 We personally use and recommend harvesting or purchasing the best, organic, minimally processed carob available. For a simple carob fudge recipe process together carob powder, lecithin, coconut oil, nut milk, vanilla and a natural sweetener. Pour into a mold, refrigerate for 2 hours and cut up into fudge squares. Carob is relatively safe to consume for most people. Generally, we recommended consulting your healthcare advisor if pregnant, nursing, taking prescription medications or if you have a serious medical condition.